A metal alloy medallion of a clown. The clown has a yellow face and purple hair, a little eyes with blinking red lights. Across the bottom of the medallion are the words "HAPPY MARDI GRAS." The medallion hangs from a 38" stand of handstrung purple, green & gold metallic beads. Each bead is separated by a small gold metallic spacer bead. 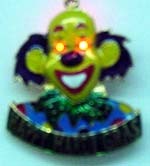 The clown medallion is 2" tall and 2" wide at the base.